Recently I've been working on the code that computes fractal data - a bit of reorganization to be able to have more independent fractal channels that are used everywhere in the engine, as I was running short of them already. Previously we had one channel where the terrain elevation fractal was computed, another channel with low-pass filtered terrain slope and 2 independent fractal channels. After the redesign we have 4 independent fractal channels, but additionally the filtered slope is computed independently for u,v terrain directions. 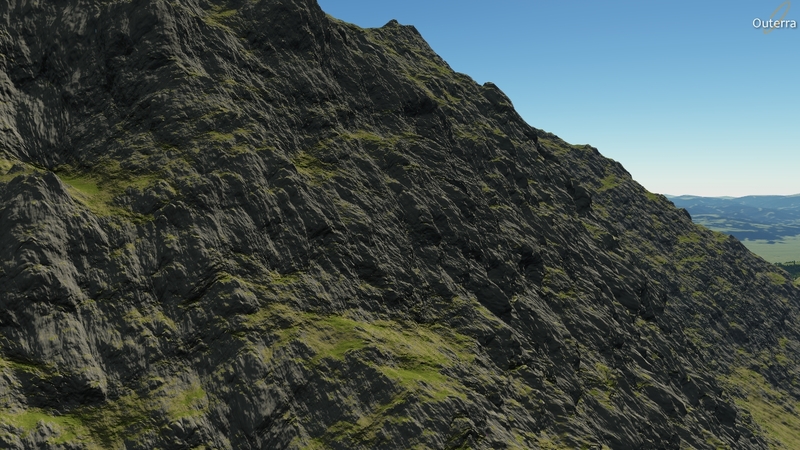 The two-dimensional slope values allow for better horizontal displacement effect on the generated terrain, because now it's possible to make the rock bulge from the hill slope in the right direction. In the previous version only the absolute slope value was known, and the fractals extruded the mesh independently in two orthogonal directions, and of course that did not always look good. The equation for the displacement was in addition parametrized, to be able to get more effects out of it. Currently it's possible to vary the dominant wavelength, bias and amplitude of the used fractal. Here is a quick comparison of what the parameters do. In the last screenshot the fractal used for the displacement is already only slightly visible and the bulbous shape of purely slope-dependent displacement shows up. 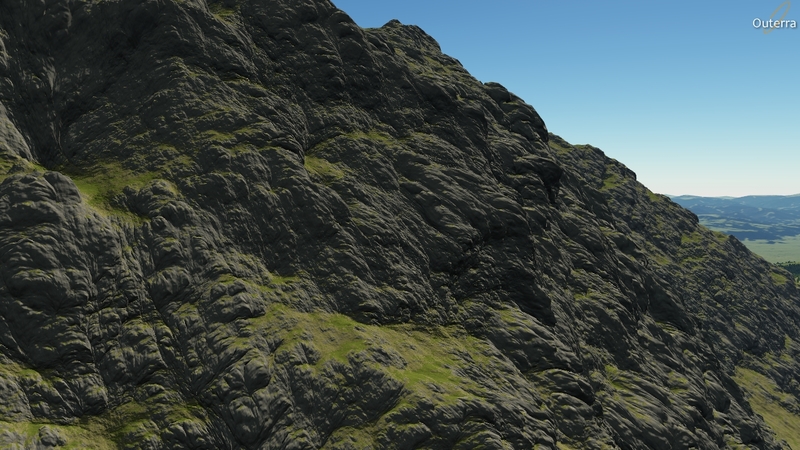 Next thing to try could be using a texture containing rough shape of specific type of erosion one would like to achieve. 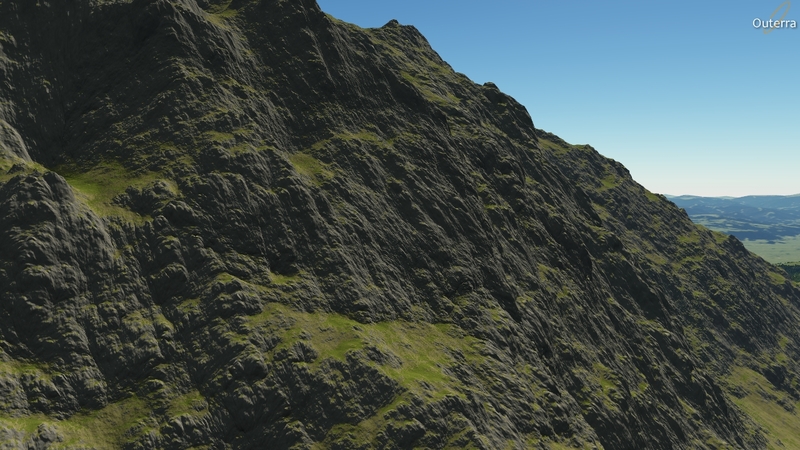 Current technique still cannot generate proper cliff and canyon walls, but combining it with the shape map lookup should theoretically do the job. 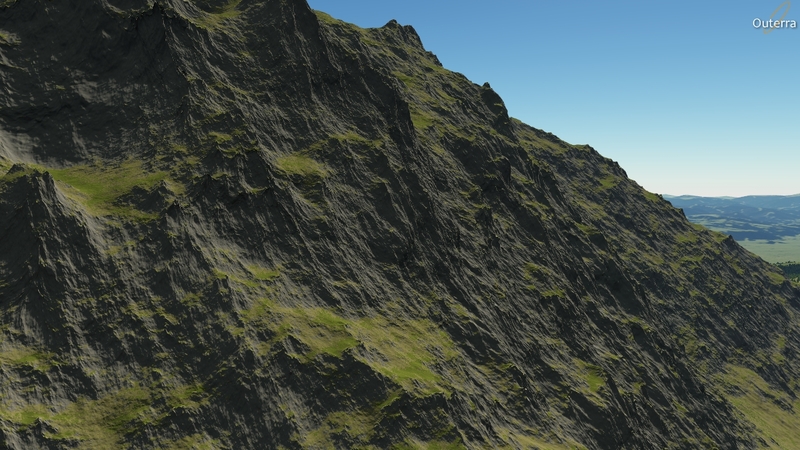 These fractal effects look promising! Did u use normal or bump mapping in the base textures? Outerra needs a Planet size modifier. < nuff said! oh wow, lol i dint see the guy there. but with this kind of detail i dont think you need any normal or bump mapping. I really love the detail in these shots! They almost look like they are from the Lord of the Rings movie, it only needs the fellowship of the ring running on those cliffs. 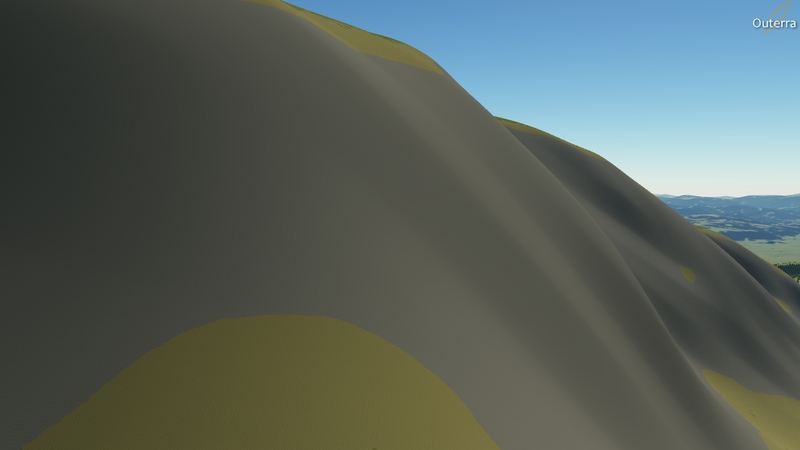 I hope to see other types of terrain also, desert would be nice with some mesa and butte type mountains. Fractal detail would be really nice in them. Just google "monument valley" to see what I mean. 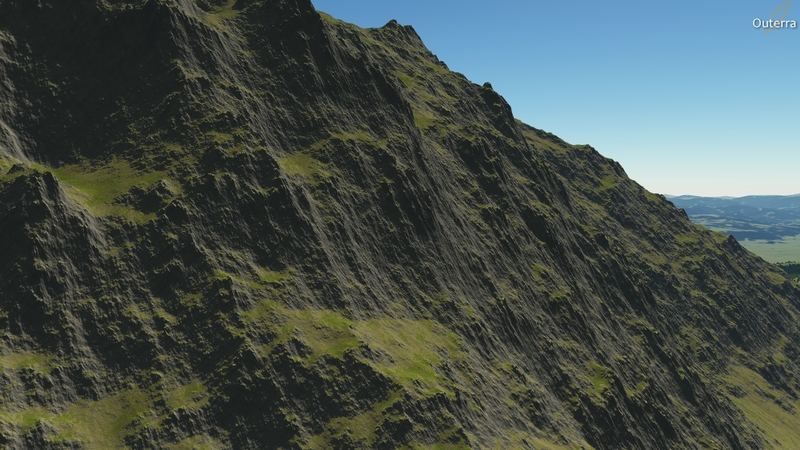 Hmm I think for those we'll need a slightly different fractal algorithm, but I'm going to try to use a shape texture for displacement that would get me those horizontal stripes. But with appropriate materials for texturing it should be nice, too.